There’s never a dull moment on the island of Ibiza, known all over the world for its unparalleled culture of celebration. The never-ending nightlife scene draws visitors all year long, ensuring quality hotel and dining experiences to match the festivities. Some of the hottest spots in Ibiza leave infinite opportunities for luxurious fun in the sun. Many visitors of Ibiza set out to spend their leisure hours indulging in the extravagant party scene that upholds the island’s unshakable reputation. But what if the party began the second you checked into the hotel? At the Ushuaia Beach Hotel the celebration comes to you, with a brand that incorporates a trendy type of luxury that gives every guest a front row seat to the magic. The Tower at the Ushuaia Beach Hotel is an eight-story collection of lavish suites where guests can enjoy views overlooking the Mediterranean coastline. With plenty of amenities at their fingertips, a typical day might involve a relaxing massage, fine dining at the Oyster and Caviar Bar, and a night swim at The Tower Pool. Guests can choose when they’d like to join the party at the neighboring complex, The Club. Unlike many hotel-nightclub relationships, booking a stay at The Ushuaia Club is just as good as buying a ticket to the show. Over 230 rooms and suites are arranged surrounding the pool and stage area, allowing guests a comfortable and personal way to enjoy the nightlife celebration. Partying ‘til dawn becomes an all out lifestyle as the nightclub experience dives right into the room, allowing guests the freedom to dance on their terrace while absorbing the pulsating sounds of the world class DJ below. Aside from stylish hotel suites and amenities, this locale also boasts a solid stream of the hottest performers from across the globe. The Ushuaia Club is the host to an event lineup under the name of Ushuaia Ibiza, featuring the likes of DJs such as David Guetta, Steve Aoki, and Avicii. 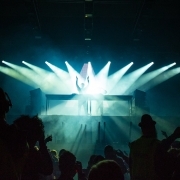 This summer, Norwegian DJ Kygo has been headlining a three-day residency at the lively open-air venue. His dedicated international fanbase has contributed to his 300 million Soundcloud and Youtube views, ensuring a successful set of appearances at The Club. Show-goers will be able to finish off their summer with a bang at his final Ushuaia Ibiza performance on August 25th. With a schedule of night-after-night partying, it’s always important to take a moment to recharge with a delicious meal. At the Sir Rocco Beach Club, guests can dine to a soundtrack of the ocean waves while enjoying homemade breads and pastas, fresh seafood, and natural juice cocktails. 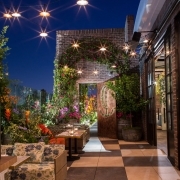 The Italian and Mediterranean cuisine is complemented by thoughtful, modern décor to create the perfect environment. A panoramic backdrop of the shore allows guests to relax and truly satisfy their cravings after a long night of entertainment. The island of Ibiza is home to some of the best celebrations in the world, and those visiting have the opportunity to plunge head first into the party lifestyle. 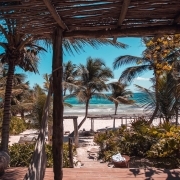 Beach leisure and blowout festivities come together to make your next tropical vacation limitless at Ibiza’s trendiest destinations. Contact concierge@zochagroup.com for information on booking a stay at the Ushuaia Beach Hotel, tickets for Ushuaia Ibiza, or reservations at the Sir Rocco Beach Club.